As much fun as Nationals was, camp was even bigger for me. We may have discovered and started to address a significant gap in my riding. Day 1 of Nationals prep. 2 lessons & a long line lesson. Next two weeks are gonna be busy! The last time I rode 2 horses in one day, I think Previous Horse was still alive, so 5 years? My intention [Plans] was daily lessons for the two weeks before Nationals. That meant eight days, Tuesday through Friday. Barn is closed Sunday and Monday. I stay home with local residents on Saturday. Therefore, eight lessons. My instructor (she became Coach during the camp/Nationals experience) immediately doubled down with two lessons a day. Well now. Day 2. Dropping & picking up stirrups with Bingo. Equitation patterns with Lola. Not sure what I have learned so far, except that 4 lessons in two days is a lot of riding. But then, that is the point of this exercise. Tweets were composed sitting in my driveway. Exhaustion was a theme. I was deeply interested in not moving at that point. Day 3. Patterns with Sam. How To Ride A Show Horse with Roberto. More than any horses I've met, ASBs love their jobs. Roberto was a blast. Sam goes better if treated as high-steppin' performance horse. 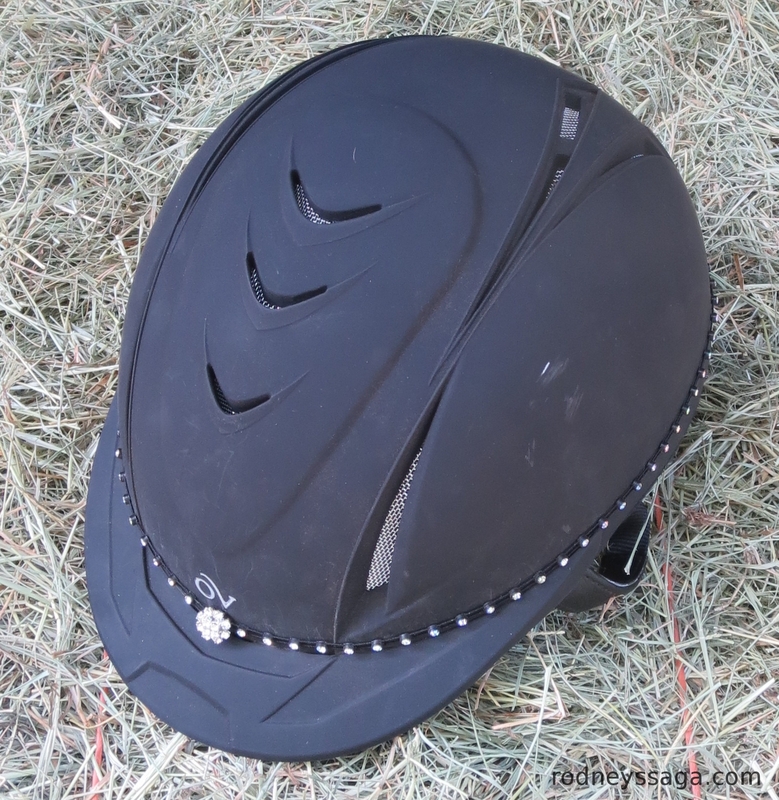 Invested in a Ovation schooling helmet to spare my fancy show hat [New]. 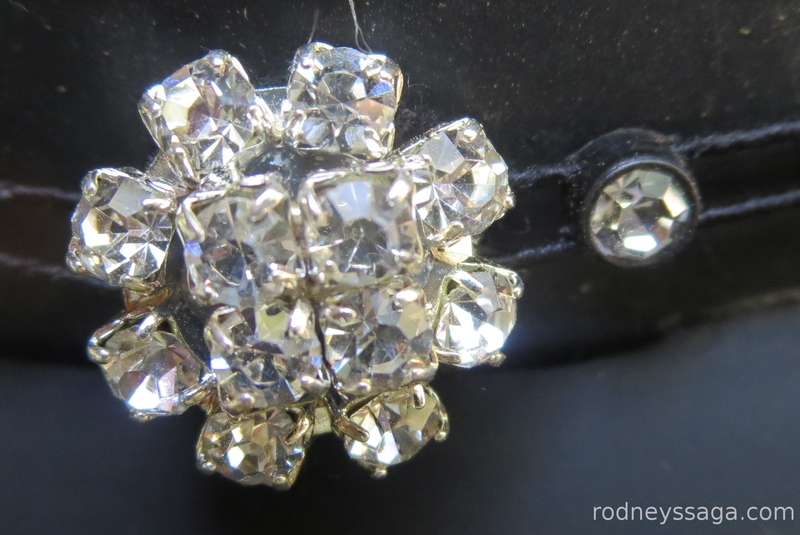 The crystal are an elastic add-on from ShowQuest. That fact that I have bling on my hat surprises everyone. I don’t know why. 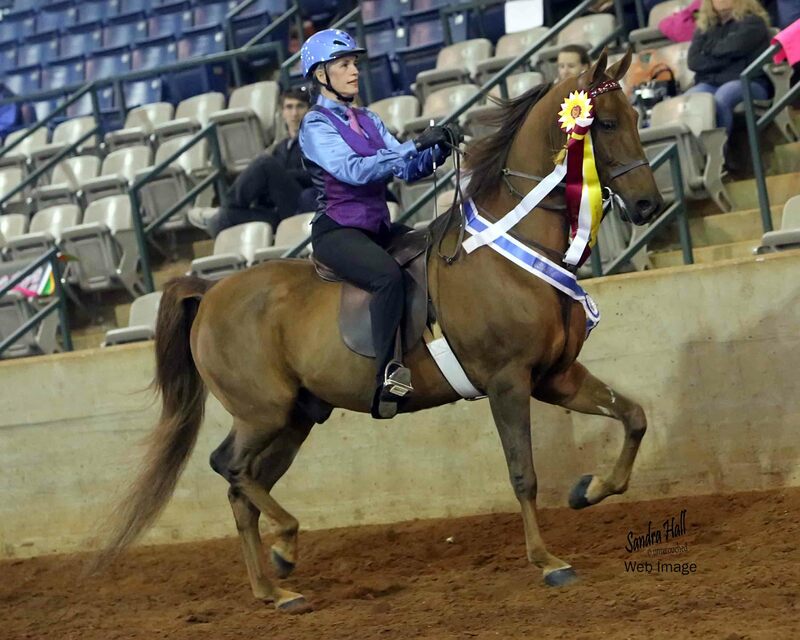 I was the one willing to ride into the show ring with a fascinator on my helmet [Dixie Cup]. Day 4. Leg lesson & pattern work on Freckes & Sam with Guest Instructor. Long line with Alvin to work on feel. Today's epiphany: I'm all in while doing the classes, but this s**t is temporary. Equitation is not my lifestyle choice. Break for 24-mile bike ride [100 Miles, Winners!]. Day 1 of week 2. Show bridle with Sam. Canter figure 8s with Trump. Long line with Alvin. It's all about learning feel. Instructor decided on long-lining to improve my rein handling. Long-lining forces me to use my hands, as seat and legs are not longer viable options. After hearing so much – so very, very much – over the years about Not Riding Backwards and Not Riding Off One’s Hands, I developed a First Do No Harm theory. If I never use the reins, then I never make a mistake. 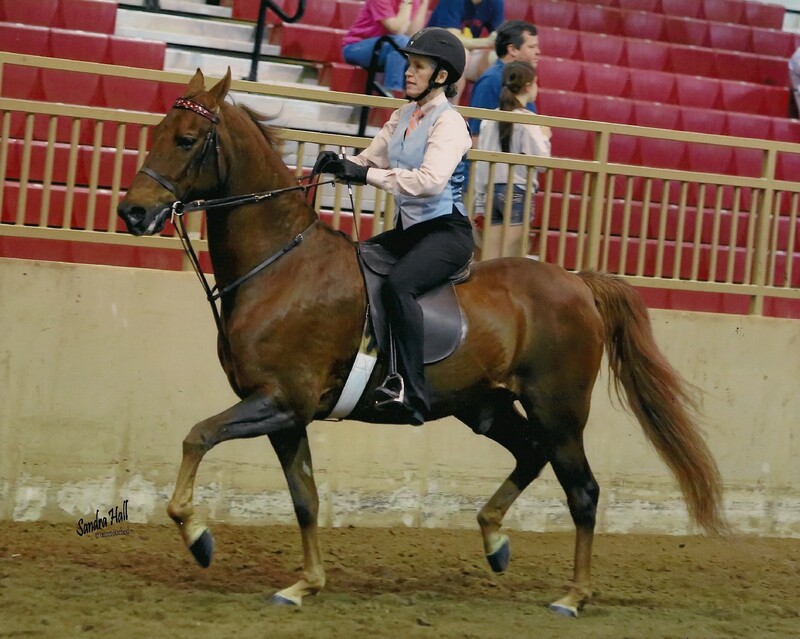 Decades of instructors yelled at me to Shorten My Reins, to Take Up a Contact. Never stuck. My hunter/jumper contact was so weak that I had no trouble immediately adjusting to the much lighter saddle seat contact. This is explains why I get along with horses who go from the seat, such as Previous Horse and Sam. This explains why I get anxious to the point of tears before getting on other horses, such as the rest of the Saddlebreds. Horses that require soft but effective hands have been a mental crap shoot for me. It works. So I am okay once I get moving. I don’t understand why it works. So I freak out on the mounting block. I need to learn to use all the tools in the toolbox. I have a responsibility to communicate with my hands as well as with my seat. Alvin in the cart. Sam in the show bridle. Me in a heap on the couch. Amazing how much riding is in driving. Hands obviously. Weight in heels. Sit back w/ upper body. Too bad not the leg aids, my strong suit. Now that I am aware of my hands, I have a better understanding of why I disliked driving so much the last time I tried it [Control Issues]. Without fine-tunable communication to the front end, I was pretty much careening around the ring being dragged by the horse. Not pleasant. Now I know why. Maybe I should try driving again. Maybe in the future even try a show or two. A small show. Alone in the ring. As a schooling exercise only. In the future. For now, we will concentrate on ridden equitation. After Nationals, we can revisit the driving question. I had just launched into this speech when she-who-talks-me-into-all-manner-of-sh*t says, Why don’t you drive at Nationals? Say whaaaaat (insert rising bleet)? Day 7 goals: Alvin organized&faster trots. 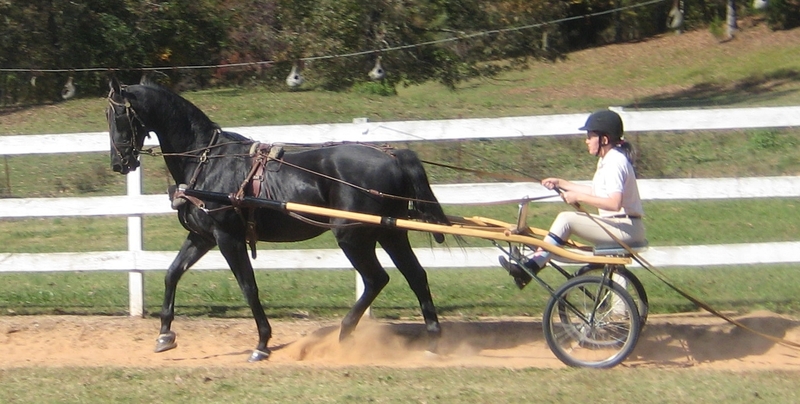 Sam organized&faster (bigger) trot; organized&slower (collected) canter. You may sense a theme. Trust is when your coach say Just Do It & you do. 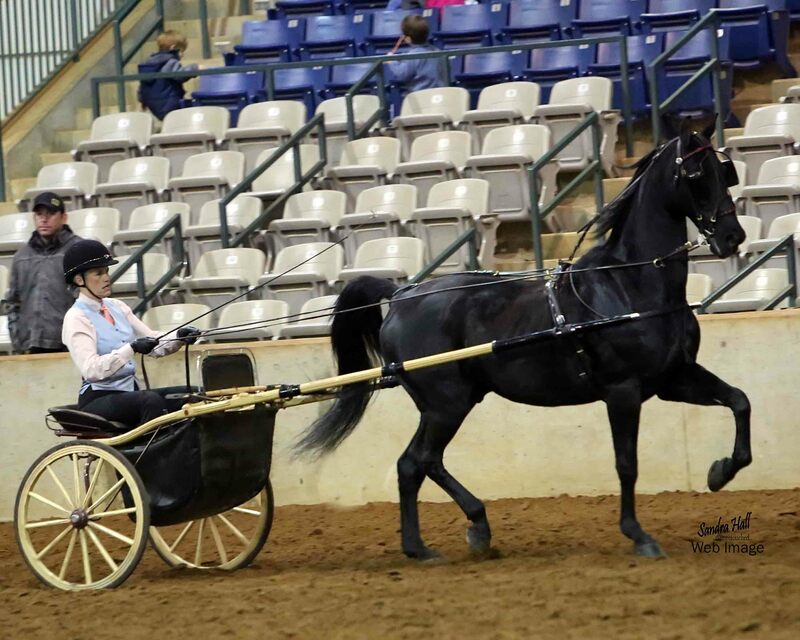 Please note, one lesson two years ago, four lessons now, one schooling drive at the show & then into the ring for my first class as the biggest class of the year with four other drivers. That’s a lot of Just Do It. Day 8. Sam. Figure 8s & reverse at the trot. Saddle seat version NOT dressage version. Alvin/cart. Getting in touch with my inner gladiator. Cart lessons continue to wipe me out physically & mentally. That's okay. It isn't a challenge if it doesn't freak you out a little bit. I’m starting to apply this under saddle. I still prefer Sam [post list & photos] to any other horse at Stepping Stone, but everyone – with the possible exception of Mark Todd, who can ride anything – works best with a certain type of horse. Knowing I will have some control over my destiny makes me – somewhat – more comfortable with idea of riding the other horses.